Make that your mantra, and you’ve just banned quite a bit of the toxicity of Easter. Besides, you don’t need plastic Easter eggs, not when there are both beautiful, vegan alternatives to plastic eggs, and beautiful, creative, unusual ways to decorate traditional, edible Easter eggs. Want something to fill with candy? This list has it. Want something extra fun and unusual to do with yet another carton of hard-boiled eggs? This list has it! 1. Egg carton Easter eggs. Bum a few cardboard egg cartons from a friend, and turn them into Easter eggs of your own. 2. Embroidery floss Easter eggs. These eggs made from embroidery floss or yarn are delicate, but quite beautiful. 3. Felt Easter eggs. Using Eco-fi felt (which is made from recycled plastic soda bottles), you can sew your own Easter egg stuffies. Decorate them with buttons and ribbons instead of dye. 4. Papier mache eggs. These papier mache Easter eggs are a favorite of mine; the kids can paint them, they’ll last forever, and they hold TREATS!!! 5. Pine cone Easter eggs. Painted pine cones make GREAT Easter eggs. 6. Rock Easter eggs. Rocks are just as fun to paint as eggs. 7. Upcycled book page eggs. Pages torn from broken books are transformed into three-dimensional eggs. 8. Wooden eggs. Wooden eggs are fairly easy to source, and you can do so much with them–paint them, color on them with Sharpies, decoupage them, glue on buttons or photos. Your imagination is the limit! 9. Felted wool Easter eggs. When my kids were too young to decorate Easter eggs, these Mama-made felted wool Easter eggs were just the thing–big, soft, and colorful! 10. Felted wool sweater Easter eggs. Sew Easter egg stuffies from prettily patterned wool sweaters. Here’s how to felt wool sweaters. 11. Hollow chocolate Easter eggs. Use the embroidery floss technique above, but substitute melted chocolate–yum! 12. Blown-out eggs. Decorate them however you’d like when you’re finished; blown-out eggs will keep beautifully indefinitely. 13. Earth Paint Easter egg dye. Natural Earth Paint makes an Easter egg dye kit that uses the same natural ingredients that you’d use to make your own Easter egg dyes, but in a quick and easy kit form. 14. Homemade natural dyes experiment. What color would the spices in your pantry turn an egg? Now’s the time to find out! 15. Plant silhouettes. These dyed eggs show the delicate silhouettes of leaves, stems, and flowers. 16. Ruby eggs. Why dye the eggshell, when you can dye the egg itself? These hard-boiled eggs are dyed in beet juice, so they turn out beautiful and fun, but with no unwanted synthetic chemical coloring. If you use natural food coloring , you can dye your peeled eggs in even more colors! 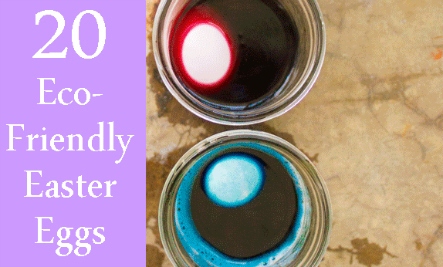 And if you’re *still* hankering for even more egg dyeing fun, check out Green Living Ideas for more natural egg dyeing tutes. 17. Vegetable-dyed Easter eggs. There’s nothing but wholesome, food-based pigment in this dye. Secret tip: to get a beautiful crimson color even more vibrant than food coloring could yield, use yellow onion skins. 18. Melted crayon Easter eggs. Use up your broken crayons to decorate eggs with a marbling effect. 19. Silk tie Easter eggs. Use those tacky silk ties to make beautifully patterned Easter eggs. 20. Tie-dyed Easter eggs. If you’ve got some junky old fabric scraps that you don’t want to use for ANYTHING, then use them to make these tie-dyed Easter eggs; fabric is the key ingredient to create that tie-dyed look on the eggs, but you don’t want to use your nice swatches, obviously. Got more eco-friendly Easter egg ideas? Leave them in the comments below. our bonds stronger in our families too! Real Easter eggs from chickens can be turned into an egg salad or deviled eggs. My family always dyed eggs with onion skins, so beautiful and the eggs are still edible! Going to try making some felted wool eggs this year, thanks! When it comes to Easter eggs - I prefer chocolate... Yum.